Credit is money you borrow from a lender in order to buy something with the understanding that you’ll pay back the money borrowed. Your credit is one of the most important aspects of your financial life. 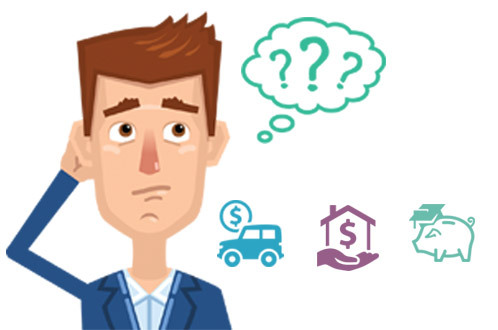 It affects things like your interest rates, your ability to buy a house or a car, your insurance rates, renting an apartment and can even affect your ability to get a job. A credit score is a number (usually between 300 and 850) that represents your creditworthiness, or how well you’ve managed your finances. Financial institutions, insurance companies and landlords use your credit score to determine the risk they are taking. A Credit report is a person’s history of credit activity and current credit statement. 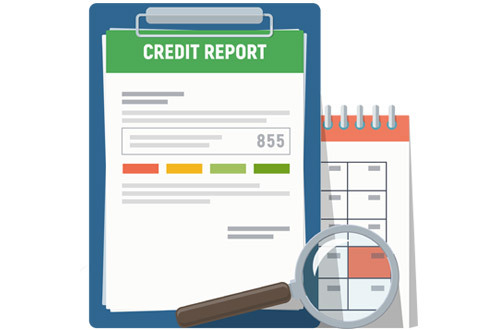 A Credit report includes personal information, such as your name, addresses, birthdate and social security number. It will also contain your open and closed credit accounts, history of those accounts (credit limit, balances, payment history, type of credit), negative remarks; such as collections or bankruptcies, and any inquires that other companies have made on your credit. There are three credit reporting companies (Experian, Transunion and Equifax) that collect and analyze your information to give you a credit score. A lender is not required to provide your information to each of the three bureaus, which means your report may be different for all three. This may also mean that your credit score can be different at each company. 35%: Payment History. Are you making your payments on time? you close to maxing out your credit card or reaching your limit? 15%: Length of History. How long you have had your longest credit line open? 10%: Types of Credit. Having a good mix of credit (revolving, installment) looks good on your credit report! Types of credit that you are likely to see include credit cards, retail accounts, vehicle loans, mortgages, student loans, etc. Your true score is known as your FICO (Fair Isaac Corporation) score. 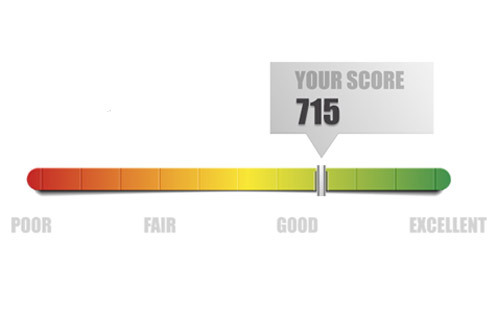 Aim for a score of 715 or higher to qualify for Altra’s best rate on consumer loans; the higher the number the better. The higher the score, the more likely you are to get approved for a loan or credit card with the best interest rate available. Credit scores are used by a variety of companies to determine what type of customer you will be. The rate you are offered by your insurance company and financials for your loan rates can be affected because of your score. Those with higher scores are more likely to get approved with the best rates available. Curious about your credit report? Visit www.annualcreditreport.com to request a copy of yours. You are entitled to receive one free report per year from each of the bureaus. While you won’t see your score, it is important to check for any mistakes or possible fraud. If a bill is sent to collections, it stays on your report for 7 years! What is a credit score? A credit score is a three digit number that’s calculated by credit bureaus that represents how well you’ve managed your finances. It’s an important number when it comes to borrowing money, renting an apartment, and even applying for a job. Lenders, landlords and employers want to know what kind of risk they’re taking. Most credit scores are between 300 and 850. Aim for a score of 715 or higher to qualify for Altra’s best rate on consumer loans! The higher the number the better! Those with higher scores are more likely to get approved for a loan or credit card and get the best interest rate available. Those with lower scores could be denied or charged a higher interest rate. Let’s see how credit scores are calculated. 35% of your score is based on payment history. This is one of the most significant components making up your credit score, because it shows lenders your track record for making payments on time. 30% is based on capacity. This means how much of your available credit you have used. The less you use the better. Try not to use more than 15 or 20% of your credit limits to keep your score high. 15% of your score is based on length of credit history. A long history of good credit habits raises your score. 10% is based on new credit. If you open a lot of credit cards or loans in a short amount of time, it can have a negative effect on your credit score because you may look risky to lenders. 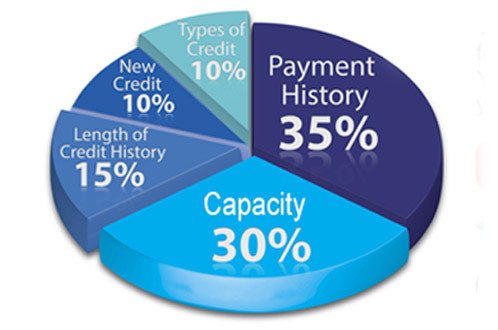 The final 10% is based on the types of credit you use. Having a good mix of credit accounts including credit cards, retail accounts, vehicle loans, and home mortgages will most likely boost your score. Your credit score is based on information from your credit report and can vary by bureau. You can request one free credit report each year from the three major credit bureaus: TransUnion, Equifax, and Experian. Visit wwww.annualcreditreport.com to request yours! While you won’t see your score, it is important to check for mistakes, bills you never knew about, or fraud. Your credit is one of the most important aspects of your financial life. The more you know about how your credit score is calculated, the easier it becomes to build good credit and manage your accounts responsibly!